Lift and shift transporting a 125m long, 1,350t rectification column to the OPaL Petrochemical Complex site. 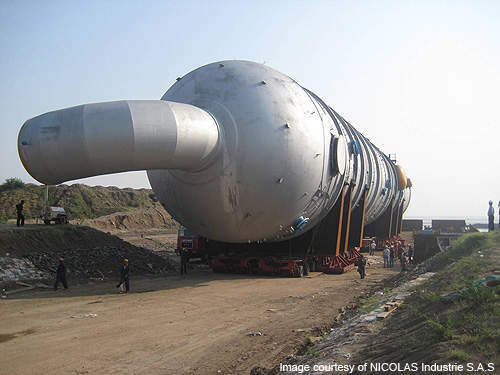 Plant equipment being transported to the site in Gujarat, India. A 13m long, 1,000t rectification column to be installed at the OPaL complex. 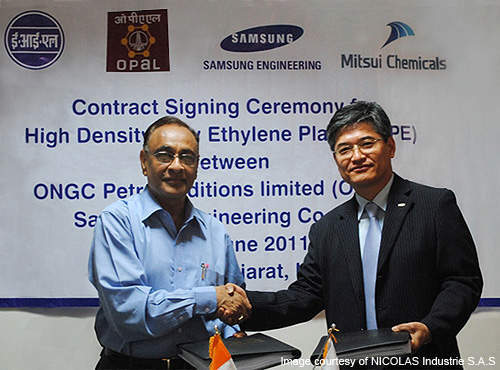 OPaL CEO PK Johri (left) and Samsung Engineering's Lucas Lee (right) during the signing of the HDPE contract. Infrastructure on its way to the site in India. ONGC Petro Additions Limited (OPaL) is constructing an integrated petrochemical complex in Dahej in the Indian state of Gujarat. Located in the Dahej Special Economic Zone (D-SEZ), the complex will be one of the largest of its kind in the country. The Dahej complex will consist of a dual feed cracker unit and associated units (DFCU and AU) with a capacity to produce 1.1 million tons of ethylene and 400,000t of propylene annually. It will have basic polymer units producing polyethylene (PE) and polypropylene (PP). The complex will also produce 135,000t of benzene, 95,000t of butadiene, 165,000t of Pygas and 70,000t of carbon black feedstock (CBFS) a year. The plant and other associated infrastructure will occupy a 508ha area. The site has rail and road infrastructure and is close to the polymer consumption market. 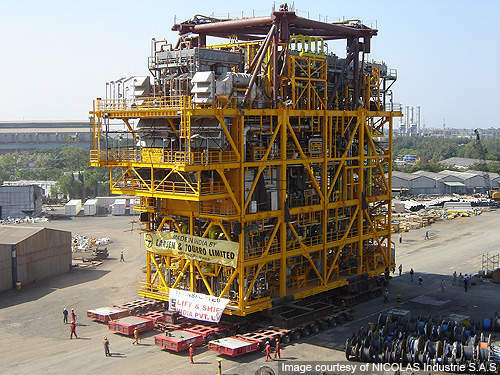 Oil and Natural Gas Corporation (ONGC), a state-owned oil and gas company, established OPaL in 2006 as a special purpose vehicle for the construction of the Dahej Petrochemical Complex. Construction of the petrochemical complex was started in 2009 and is scheduled for completion in 2013. It will significantly boost the petrochemical sector besides generating about 1,000 permanent and 15,000 direct and indirect jobs. 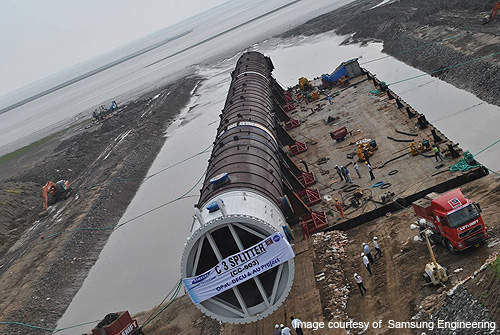 The entire project is estimated to cost Rs195bn ($4.3bn). The SEZ complex will supply about 50% of its production to overseas markets such as Africa, China, Vietnam, Malaysia, Indonesia, Singapore, Turkey, Pakistan, Bangladesh and Sri Lanka. ONGC owns a 26% stake in OPaL. The gas authority of India limited (GAIL) owns 19% and Gujarat state petroleum corp (GPSC) 5%. Strategic investors and financial institutions will make up the remaining 50% ownership. The initial public offering (IPO) is planned in 2012. GAIL will be responsible for marketing the production from the complex as per a cooperation agreement signed in January 2011. The company is also planning to set-up a synthetic rubber plant at the site. About 26 banks are funding Rs87bn ($1.9bn) loans for the OPaL project. The State Bank of India (SBI) is the lead bank. OPaL awarded a $1.43bn engineering, procurement and construction (EPC) contract to a consortium of Samsung Engineering of Korea and Linde of Germany in 2009 for the DFCU and AU project. Linde provides basic engineering and supplies critical components for the project. Samsung is responsible for detailed engineering, supply of remaining construction equipment and assembly of the plant. Linde Engineering India (LEI) is responsible for the mechanical erection of eight cracking furnaces. The scope of work includes installation of a pipeline, equipment, refractory, insulation, painting, pre-commissioning and commissioning of the furnaces. It is scheduled for completion in the third quarter of 2012. Linde contracted Hyperion Systems Engineering to supply an operator training simulator for the cracker project. In June 2011, Samsung Engineering was awarded another $229m EPC contract for a dedicated HDPE plant at the complex. 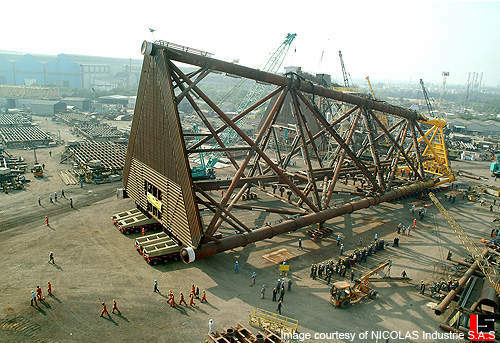 It will have a production capacity of 340,000t/y and is scheduled for completion in August 2013. In June 2011, OPaL selected Tecnimont ICB of India for constructing the two polyolefin plants at the integrated complex. The contract includes construction of a 340,000t/y PP plant and 360,000t/y capacity high density PE (HDPE) and linear low density PE (LLDPE) swing units. The value of the lump sum turnkey contract for the EPC of the two plants is Rs1.98bn ($440m). Linde will supply its steam cracker process technology for the ethylene cracker. In February 2010, OPaL contracted INEOS Technologies to licence its process technologies for the olefin plants. The PP plant will use Innovene PP Process. It will produce homopolymers, polypropylene random and impact copolymers. The PE swing plants will use Innovene G Process. In July 2011, Mitsui Chemicals was selected to licence its proprietary HDPE manufacturing technology for the dedicated HDPE plant at the OPaL complex. ONGC will supply the dual feedstock (C2/C3 gas and naphtha) for the petrochemical complex from its units in Ankleshwar, Uran, Dahej and Hazira. Naphtha will be supplied through an onshore pipeline. In 2008, ONGC also constructed a methane-propane (C2-C3) recovery plant to supply feed to the Dahej complex from natural gas. ONGC will supply about 1.5 million tonnes of naphtha and 0.9 million tonnes of olefins a year. In July 2010, engineers India limited (EIL) was chosen as the project management consultant for the cracker project. Foster Wheeler was the front end engineering design consultant. Bharat heavy electrical (BHEL) is the captive power plant (CPP) contractor. Toyo Engineering was the EPC contractor for the C2-C3 feed plants. The infrastructure at the site is being developed by the IVRCL Group under a $209m contract. Lift and shift provided the transportation services for the OPaL’s rectification columns using NICOLAS Industrie vehicles.